Since 2008 the craft beer industry has exploded in South Africa, growing from just over 20 microbrewers to in excess of 140. In this fast-growing industry making your brew stand out is a challenge that starts on the shelf, and to start that journey you need to identify your brews character, as well as who you are targeting and what are they looking for. Generally, people are choosing craft beer because of the creativity it embodies, the varieties available and purity of the product, your craft beer label match that and convey this message to your target market. Illustrations: If you are appealing to the young at heart for example, position your brew as carefree and fun by designing a distinctive, cheery illustration that will stand out from the crowd. Minimalist: Another idea is to be simplistic and uncluttered with sleek clean lines, conveying the pure natural nature of your beer. Traditional: Create a sense of nostalgia by using traditional elements in the colours you use as well as the lettering. This will go a long way in appealing to the old-school beer drinker. Graphics: Another option is to go bold. Big, eye catching graphics in striking colours work well in setting your beer apart. Using current design trends will also appeal to the young and hip. Once you have made the decision on what style embodies your brand you need to choose the supporting cast. Colour is an easy win, it has the ability to convey, at just a glance, what your beer is all about. A colourful illustration on your craft beer label next to a simple crest will definitely demand the consumers interest as would a snow-white label with simple gold lettering. 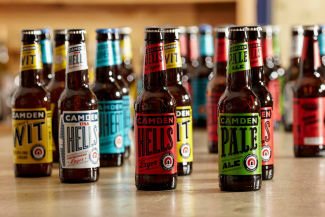 When considering your label colour, the type of beer you are crafting, together with your choice of bottle are significant factors to take into consideration. The three most common bottle colours are brown (which has the advantage of acting as a filter to harmful rays), clear and green, which are options when brewing beers with little to no hops. Clear bottles allow the contents to be your back drop, while a brown bottle provides a neutral backing for your label, making almost any colour an easy fit. The use of specific colours in your craft beer label can also help customers to identify the type of beer that’s inside, for example, dark brown for a stout and red for red ales. That being said, this is also a way to set your brew apart from the masses and start building a brand that consumers will recognise. Size really does matter, especially when it comes to your craft beer label. Once again, your choice of bottle is an important consideration, it will influence the amount of space you have, as well as the positioning of the label. The type of bottle will also be a consideration in deciding between a standard or custom cut label as well as wrap around or separate front and back. Make sure too that there is enough space to contain your design and all the necessary information, and finally all these considerations also need to fit within your budget. Which takes us to the material to be used. You need to consider the durability of your craft beer label, the cost and its ability to stand out on the shelf. In a study conducted by Clemson University, consumers quickly fixated on glossy film labels, followed by wood veneer, then metalized film labels. 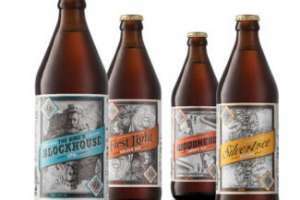 Paper labels were deemed the least expensive and metalized film labels the most expensive, this is important when considering your target market as well as the character of your beer. Home brewed purity? Then a paper label would be the best choice for your brew. Sophisticated and cutting edge? Metalized film is probably the better option. Keep your choice close to the character of your product, but don’t forget the required durability of a craft beer label. Last, but certainly not least, is what you say and how you say it. Make what you say count, with limited space and the highly competitive environment, your label needs to stand out and say it all in one easy glance, so consider your words and the font you choose carefully. There is also specific information that must be included on your label, the address and name of the producer, as well as the ingredients, any additives and an allergen indication amongst them. Make sure that you leave sufficient space to cover all the legal requirements when considering your design. Rebsons Labels is a leading supplier of labels in South Africa and produce self-adhesive labels for local and international clientele from various industries. 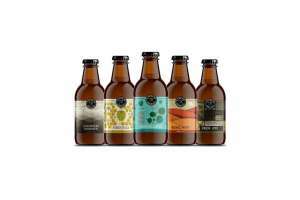 For the highest quality craft beer labels through either digital printing or various other label printing processes contact Rebsons Labels today to discuss your needs.